The month of November is designated as Manatee Awareness Month and is an opportunity to call attention to this endangered species, which is Florida’s official state marine mammal. Note: A high resolution jpeg (300 dpi) of a manatee image is available upon request. 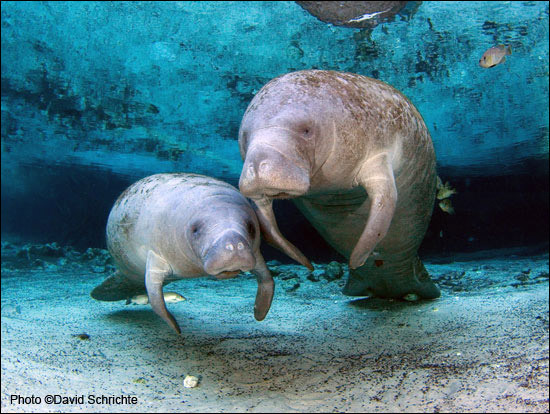 Around this time, manatees travel from their summer haunts, such as rivers, estuaries, and bays, to their winter refuges comprising natural springs and artificial warm-water sites like the effluents of power plants. Since they are a sub-tropical species, they can’t tolerate prolonged exposure to water temperatures below 68 degrees Fahrenheit and therefore must seek warm-water sites for their very survival. Save the Manatee Club is an international, award-winning, nonprofit conservation organization and has been the voice for endangered manatees since 1981 when it was co-founded by singer/songwriter Jimmy Buffett. “Our mission is to protect manatees and their aquatic habitat for future generations. In order to do that, we have a variety of programs, including offering numerous free resources to the public,” said Rose. The public can obtain free waterway signage, boating banners and decals, waterway cards, and educational posters. The shoreline property signs warn boaters to slow down for manatees and feature the Florida Fish and Wildlife Conservation Commission’s hotline number (1-888-404-3922) to report sick, injured, and orphaned manatees. The Club also produces outdoor signs for state, municipal, and county parks, marinas, and other sites where human/manatee interactions are a problem. To obtain any of these free materials, you can email education@savethemanatee.org or call 1-800-432-JOIN (5646) and request these resources. Educators can also request a free educator’s guide filled with classroom activities and interesting manatee facts. Save the Manatee Club encourages the public to watch manatees in their natural habitat on the Club’s webcams at ManaTV.org. This is an educational opportunity for people around the world to see live manatees in real time and watch them play and interact with each other in the waters of Blue Spring in Orange City, Florida. Once at the website, you can also read researcher Wayne Hartley’s daily blog. Hartley is the Club’s Manatee Specialist and a former Park Ranger at Blue Spring State Park. He has been researching the Blue Spring manatees since 1978. Hartley’s research has resulted in a very extensive body of knowledge on the manatee’s life history, as well as how they use natural warm-water springs to survive the winter months. Earlier this year, the Club introduced a new Livestream program, which is also free and makes learning about manatees accessible to school classes across America. The program features Wayne Hartley and the Blue Spring manatees. The educational sessions are on the Internet and take place on Livestream, which is a video live streaming platform. For more information about participating, educators can send an email to education@savethemanatee.org. The public can also adopt manatees who take refuge at Blue Spring during the winter months. “Each adoptive parent learns about the species by following the manatee they’ve adopted through adoption materials and follow-up newsletters. Sometimes the conservation of a species can be overwhelming because there are so many factors involved, along with complicated scientific facts. But adopting a real, living manatee makes it all personal, and people seem to like that a lot,” said Rose. Visit Save the Manatee Club’s website at savethemanatee.org for more information on the species, their aquatic habitat, and how to get involved in conservation efforts.